I know I have to write about beauty for this blog, but I found interesting article about M&M’s! 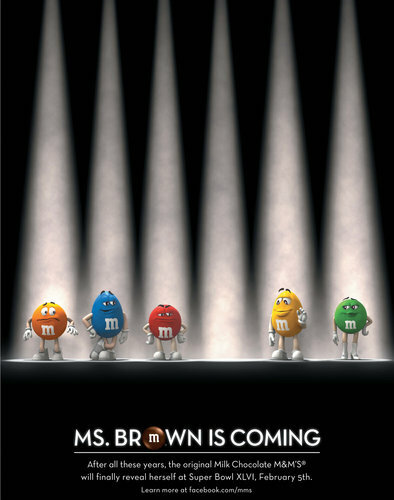 On February 5th, during the Super Bowl, finally, Ms. Brown will be unveiled! Super Bowl commercials, many of marketing people would like to buy ad spots during Super Bowl, and many companies have made really interesting and funny commercials until now. TV commercial is high expense for any company, and like recent under not good economy, most of past clients decided not buy the spot. But, still Super Bowl commercial spots are attractive for many companies, and this year M&M’s will use this spot to introduce new character to us! Economy situation still has to be taken care of a lot from so many aspects, but on Feb. 5th, I believe we will see one of the light of the tunnel.